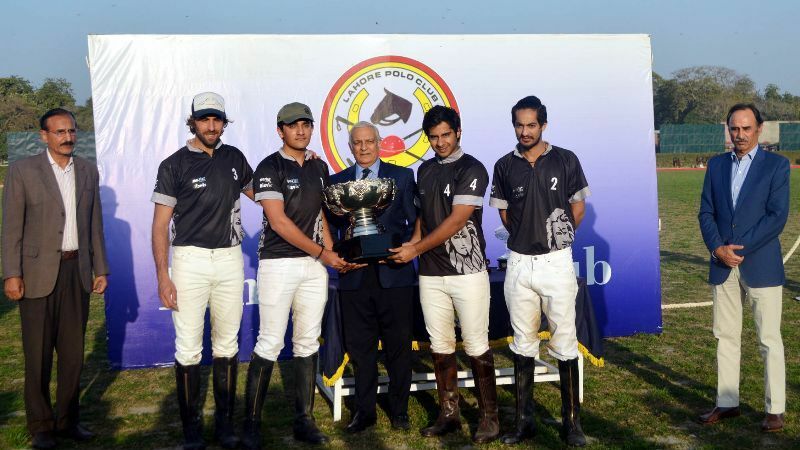 Juan Cruz Losada and Hamza Khan once again excelled in Rizvi’s/Master Paints title win over Army Whites in the Spring Polo Cup 2018, main final played at the Lahore Polo Club (LPC) ground in Lahore. Both Losada and Hamza amused the huge crowd with their remarkable performances as both slammed in four goals each in their team’s title triumph while Aun Rizvi banged in the remaining two goals to complete the tally for the victors. From Army Whites, both Ignasio Negri and Brig Zulfiqar Ali Baig also played very well and hammered a hat-trick each but their efforts couldn’t bear fruit for their team. Losada was the man-in-form, who scored the opening goal of the final to give Rizvi’s/Master Paints 1-0 lead. Another in-from player Hamza then converted two fabulous field goals to give his team 3-0 edge. Army scored their first goal in the second chukker through Ignasio to make it 3-1. But Rizvi’s fought back well and thwarted three tremendous goals – one each by Losada, Aun and Hamza – to have healthy 6-1 lead. Losada continued his good form in the third chukker as well and fired another field goal to further enhance Rizvi’s lead to 7-1, which was soon reduced to 7-2 by Brig Zulfiqar. The high-voltage fourth and last chukker saw Army bouncing back through four goals but on the other hand, Rizvi’s also played aggressively and pumped in three more goals to meet the pace of their opponents, thus took healthy 10-6 lead, which remained till the final whistle. From Rizvi’s, Losada, Hamza and Aun contributed one goal each while from Army, Ignacio and Brig Zulfiqar were the scorers, who banged in a brace each. The final was supervised by Macos Araya and Salvador Ulloa as field umpires. The subsidiary final was won by Newage/Guard Group, who outlasted Army Red by 9-5. Salvador Ulloa was star of the day for Newage by firing fabulous five goals while Taimur Ali Malik scoring a brace and Adnan Jalil Azam one goal. From the losing side, which had 2 goal handicap advantage, Major Faizan Tassaduq hammered all the three goals, but his efforts were futile in the end. Former Chief of Army Staff (COAS) Gen (r) Jahangir Karamat graced the final as chief guest and gave away winning trophy and shields to the winners and top performers. Also present on the occasion were Lahore Polo Club president Irfan Ali Hyder, executive committee members, secretary Col (r) Shoaib Aftab, families and a great number of polo lovers.